The history of this castle is related, even before its first foundation stone, to its creator, Ludwig II, King of Bavaria (1845-1886). Inspired by the romance of the medieval stories with knights and princesses, from the childhood spent at his parents’ summer residence (the present Hohenschwangau Castle) he was attracted by the ruins of a castle on the Schwanstein cliff. Crowned King of Bavaria at the age of 18, in 1864, he began the construction of the Neuschwanstein Castle in 1869, construction that lasted for 17 years up to the King’s tragic and mysterious death, the castle is not being finished even now. Located in a magnificent place, at the bottom of Tirol Mountains, with three lakes surrounding it, on a 90 m high mountain ridge, between two cliffs under which is a 50 m waterfall, the Neuschwanstein Castle (Neu-schwan-stein, The new cliff of the swan) has more than 90 rooms on several floors, however only 16 rooms are finished (the most impressive being The Singers Room, The Throne Room, the Vault, and the Bedroom). In 1886, a few weeks after King’s death, it was opened to public until present days, having 1.4 million annual visitors from which 6000 daily visitors in the summer, becoming one of the most visited castles in the world. Being sequestered by the German state and remaining in its possession, it can be visited along with the Hohenschwangau Castle, which remained in King Ludwig II’s family’s possession: the Wittelsbach Family; the opinions regarding life, the decisions and the dreams and accomplishments of King Ludwig II are very different in the two tours of the two castles. It is known that King Ludwig II was loved greatly by the population of Bavaria and the Neuschwanstein Castle was included as a proposition on the list of “the New 7 wonders of the world”. 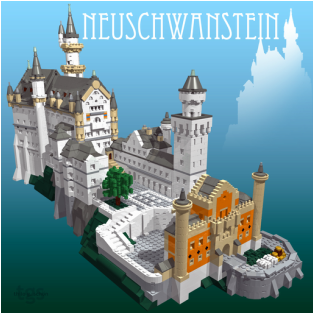 Moreover, Walt Disney inspired himself and participated with his ideas at the construction of Cinderella’s Castle, inspired after Neuschwanstein, being used even in the logo from the beginning of Disney cartoons. Although I have visited it 7 times and thought of building it out of LEGO bricks, the American Robert Carney set the bars too high by using over 52500 pieces. I gladly decided in 2015 to purchase the construction instructions for the German Thilo Schon’s project. He created a version of over 4300 LEGO pieces. 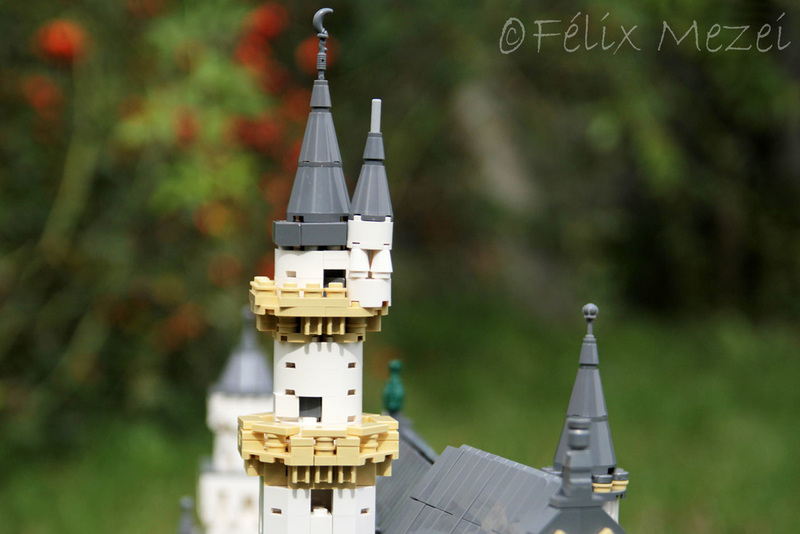 The castle is closely represented, even though, at its size it is limited by the available LEGO shapes and colors. Out of respect for its creator, I’ve decided to follow this variant as much as possible and the changes that I’ve made fairly neglectable to the scale of the entire project, nevertheless, I do consider them improvements. These would be as it follows: the ornaments and the small round balconies from the entrance gate, the knight’s statues along with the lion from the roof, the bas-relief (of St. George killing the dragon). 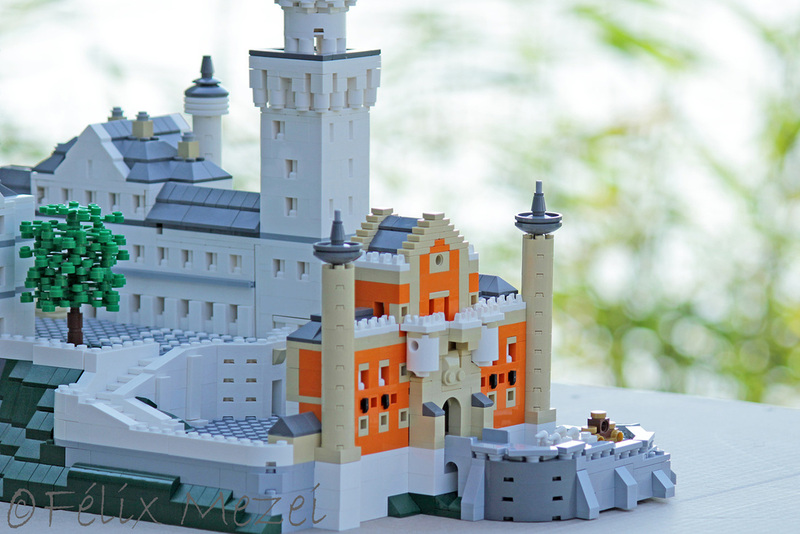 Other changes have consisted in replacing some of the rare LEGO bricks, and therefore expensive, with some similar ones which are elusive due to their same color and shape. These replacements have risen the number of necessary LEGO bricks to 4588. Benefiting of Thilo Schon’s creation work, has left to me only the difficult job for a month and a half to stock the necessary pieces, to identify the pieces which were impossible to find and also to order them with as little money as possible ( a total of eleven stores and eight countries) and finally to build it up completely - including the updating of its construction instructions which would envelop all the modifications. The final cost of the project was 1600 euros. I have to mention that, besides my personal contribution, I have also been financially helped by my friends Rolland Olajos, Tibor Nagy and the Lithuanian Lukas Volskevicius. They all have helped me to bring the project to a successful end and I would like to give them a special thanks.